I LOVE my family. Don’t misunderstand me, but if I could have the same family only Italian-ier, I totally would. Seriously. 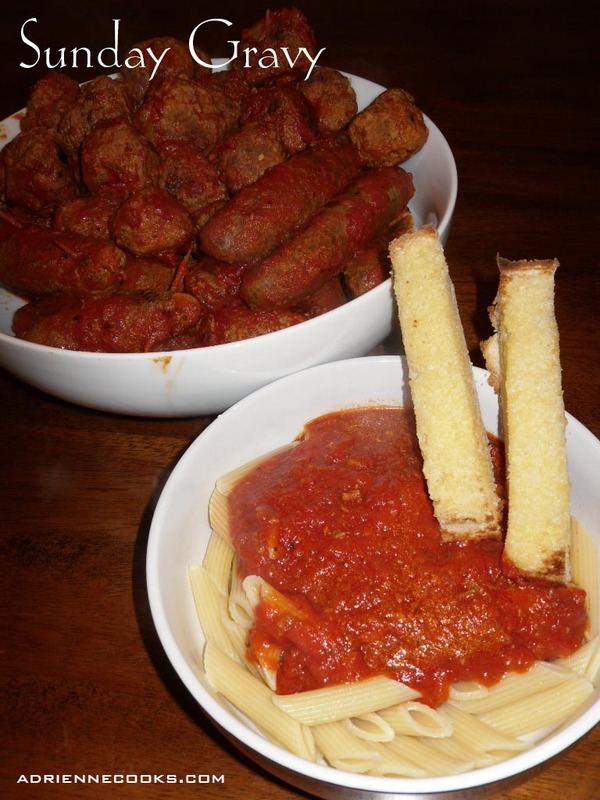 I love Italian food and traditional meals. Pasta at Christmas, yes please! Mixed grill, cured meats and more pasta at family meals, sign me up! Forgive the blubbering above, but I really love Italian meals. 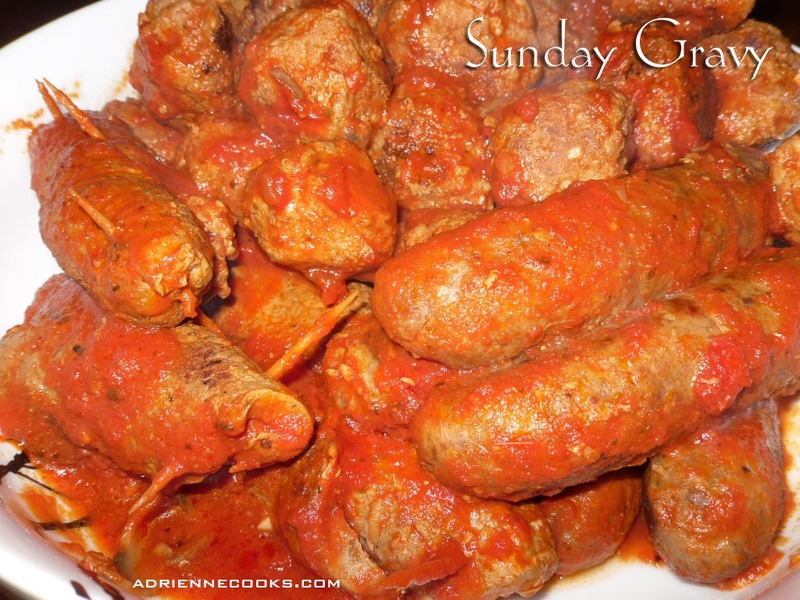 This Sunday Gravy is really a “why-didn’t-I-make-this-sooner” meal for me. It’s an easy meal that will certainly fill you up and make your tummy happy. Do you like meat? Good. Me Too. Now get some meat. Make a helluva red sauce. Sear meat. Place meat in sauce. Cook. Cook for a while. Make some pasta. Put pasta in a bowl, top with your favorite meat and dress with extra sauce. Now stuff you face. If you can manage to keep leftovers you’ll find its good the next day too. Slap the meat on bread, dress with sauce, cover with provolone or mozzarella cheese, broil for a minute and slap it together and wrap your lips around it. Heaven! 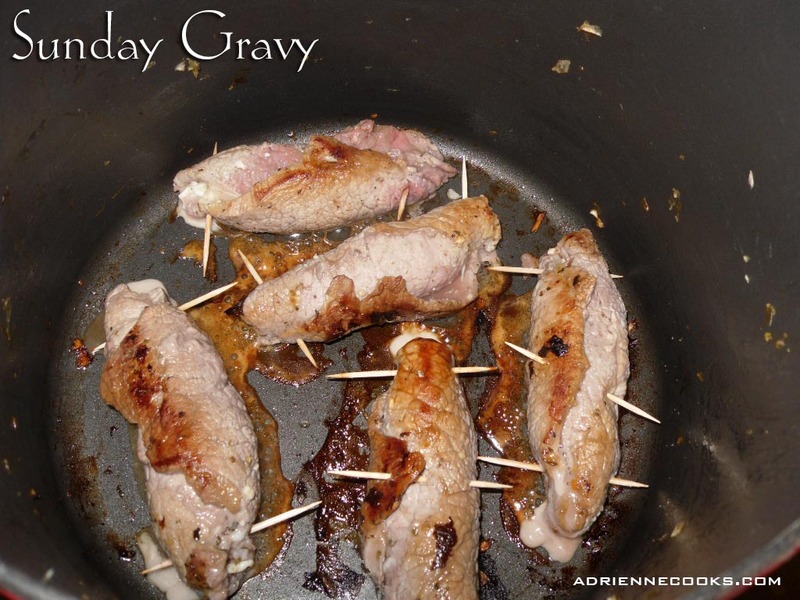 You can create your gravy with any meat you prefer, the recipe below if for the meal you see pictured. After your meat is 1/8” thick rub each side with grated (of smashed – use course salt on a cutting board and smash with the edge of a knife until garlic is a paste) garlic. Season with salt and pepper (just pepper if you used salt for the garlic). Place a tablespoon of cheese (cut string cheese in half if using, and cut length to fit on meat) 1 inch away from edge. Roll up around the cheese and secure with kitchen twine or toothpicks, I used toothpicks. 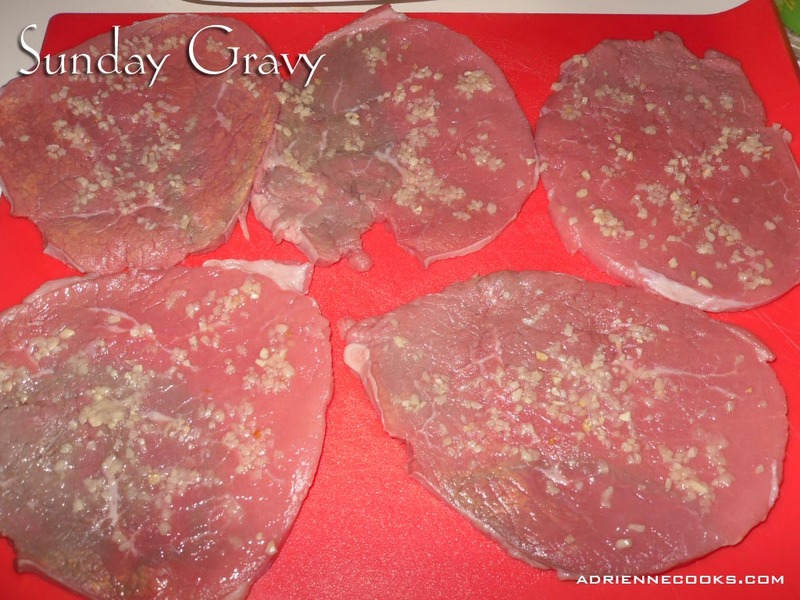 Proceed with Gravy recipe! Add 1 tablespoon of olive oil to your pot over medium high heat. Brown your sausage first in a large pot or Dutch oven. 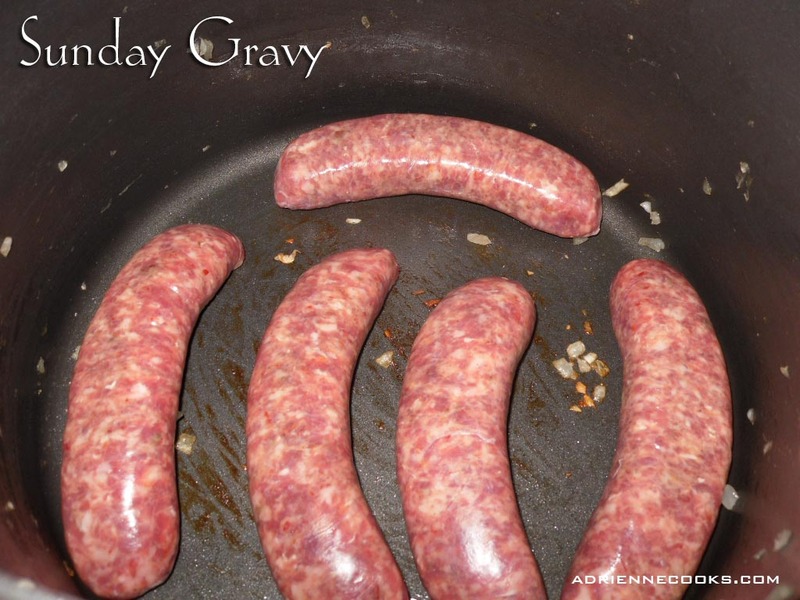 Get a nice brown crust on both sides of the sausage, remove from pot. Now cook your meatballs in the drippings, if there aren’t enough drippings, add a little olive oil. Make sure to brown as many sides as possible. 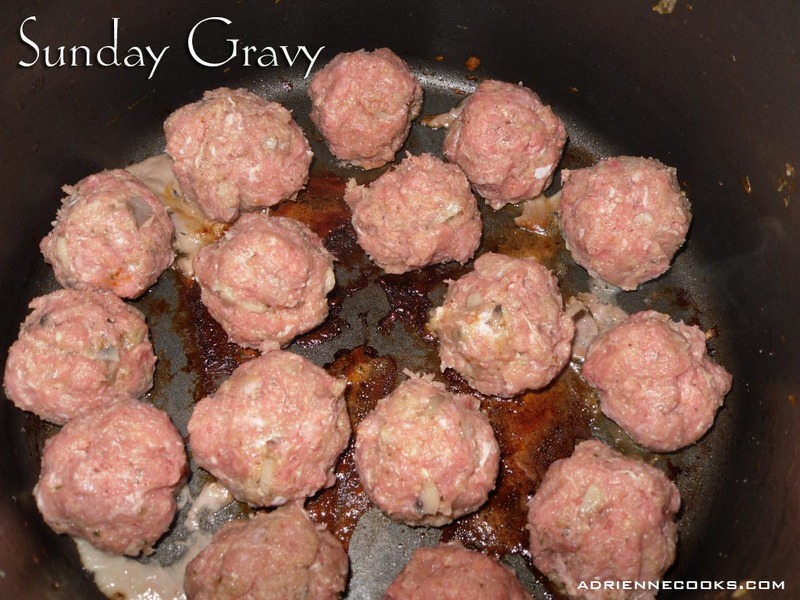 Remove browned meatballs from pot. Next brown off the braciole. Brown at least two sides and remove from pot. Sauté your onion and garlic reserved for sauce in the drippings as well. When the onions are clear you can add your tomatoes. Stir in the seasoning. Bring to a hearty simmer (because your tomatoes were canned, you boil them, ‘cause my mom said so) now reduce heat and add your meat back to the sauce. I told you A BIG pot! I hope you listened. Now let simmer (a bare simmer, the cute kind where every few seconds a bubble pops up from the bottom with a “plop” noise) for 3-4 hours or more. I start right after breakfast and we eat it for dinner. Toast up some hearty Italian bread, with garlic of course and boil a bit of pasta like penne or rigatoni to hold that sauce. Now serve to your happy family. They’ll no doubt be ready to eat after smelling this delicious meal all day! Sunday Gravy Meats Ready To Eat! I was serious about that sandwich by the way. 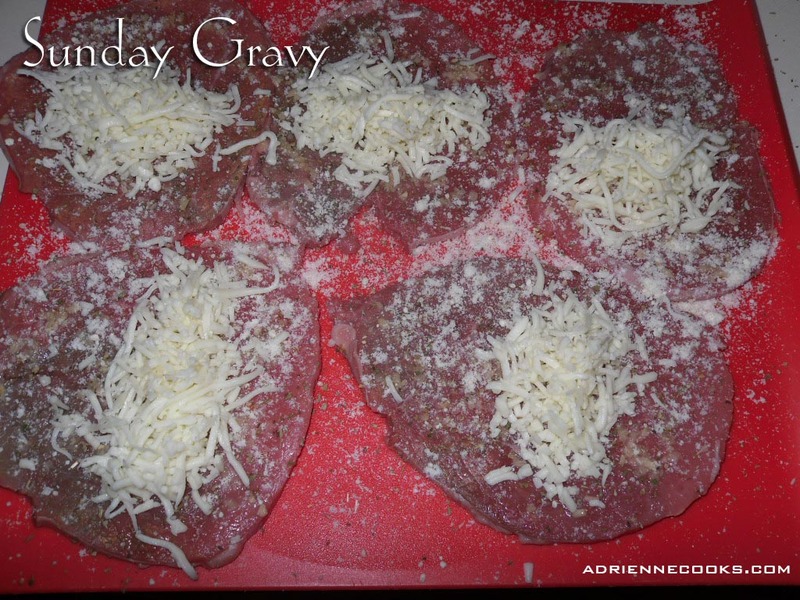 Save a little bread and put your sausage or meatballs (reheated in the microwave a bit) on the bottom, add a little sauce, top both open sides with cheese – put it under the broiler and melt the cheese, slap it together and eat. Om-nom-nom. You’ll thank me. Thanks for stopping by Baking & Babies! That recipe looks awesome…I’m dreaming about it on a sandwich covered in cheese. YUM. I’m almost 60 years old and when I was a child my family ate (almost vegetarian). Where did I prefer to eat whenever I could? At my best friends house. She is Italian and everyday her mother had a fresh pot of gravy cooking on the stove, and everyday she had some kind of meat to have along with it. I wanted to live in their house! I wanted to be Italian too! 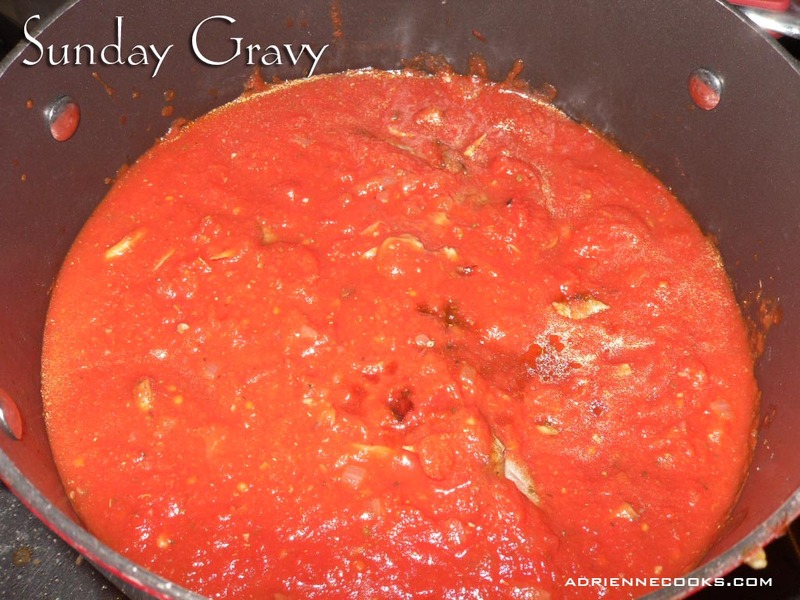 I believe that the Sicilians call the “gravy”, sugo. I prepare my meats the same way that you do, and then use my crockpot to let it simmer all day. The sausages are my favorite– they melt in your mouth. No knives needed! I’ve also seen many recipes that add raisins to the braciole roll, as well as breadcrumbs and basil inside with the cheese (which is usually provolone), but that may be a regional thing. I’ve tied it with rasins and they are surprisingly good. And I’m not a big fan of cooked raisins.